Visitors to the Pennsylvania Longrifle Museum of the Jacobsburg Historical Society often show interest in the unique underhammer guns on display in the museum. These firearms are quite rare and are very unique for this area. It is fortunate that all the original Henry Gun manufacturing facility shop records remain intact and can be studied. The records are currently housed at the Hagley Museum in Delaware; however microfilm and digital copies are in Society archives at Jacobsburg. 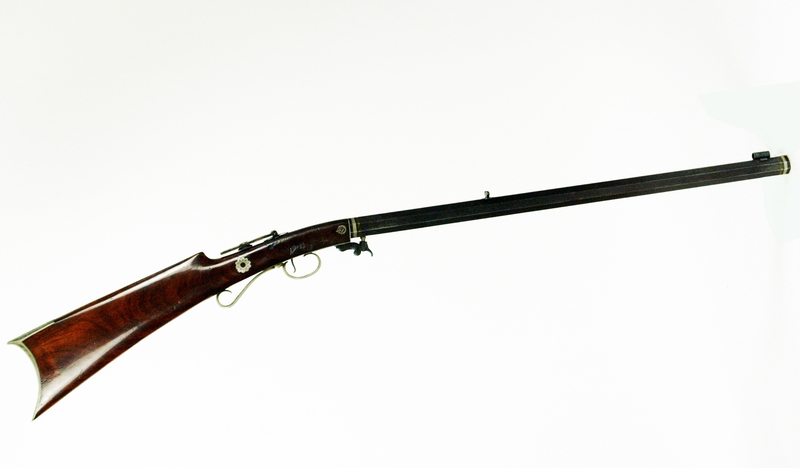 A study of the quantity of rifles recorded as having been produced in earlier years, prior to underhammer production, suggests the total number of underhammer rifles produced over that four year production period would have been considerably less than 100. The percussion underhammer ignition system was popular in some areas, including New England, in the first half of the nineteenth century. Underhammer pistols were often carried by their owners in the boot as a concealed weapon while riding in a buckboard wagon or coach. The pistols could be quickly removed from the boot without “hanging up” on the hammer while being pulled out. Records do indicate a total of 2300 underhammer pistols (see photo below) were produced over the four year period. Totals produced are recorded as 1200 in 1836, 700 in 1837, 300 in 1838, and only 100 in 1839. The anticipated demand for these unique firearms seems not to have materialized. Most of the underhammer pistols consequently were sold under the name “Smith,” a St. Louis merchant, or were unmarked. Only two known underhammer rifles and one pistol bearing the name “J. J. Henry” remain in existence today. J. Joseph Henry died in 1836, the underhammer’s first and biggest year of production. An additional eight unsigned pistols are known to exist, which would indicate a known survival rate of only .1%. 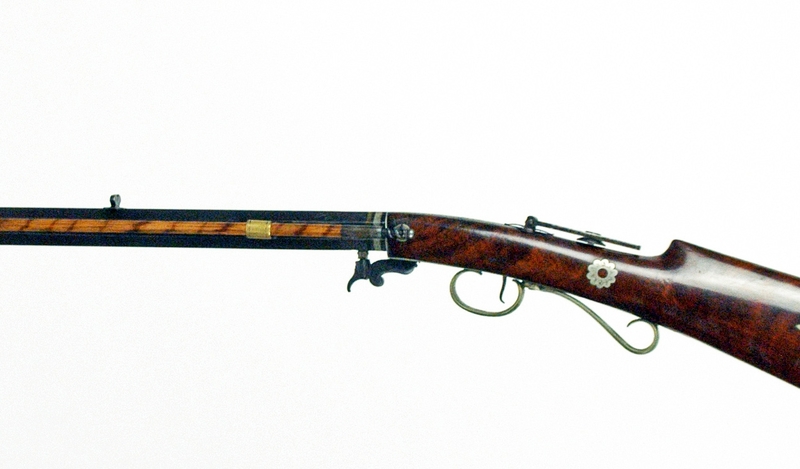 In 1837 James Henry took over the business marking his guns “J. Henry.” We don’t know precisely when the stamp was changed, but numbers would suggest the total underhammer production under “J. Henry” to be about 1000. One underhammer rifle signed “J. Henry” is known to exist today. 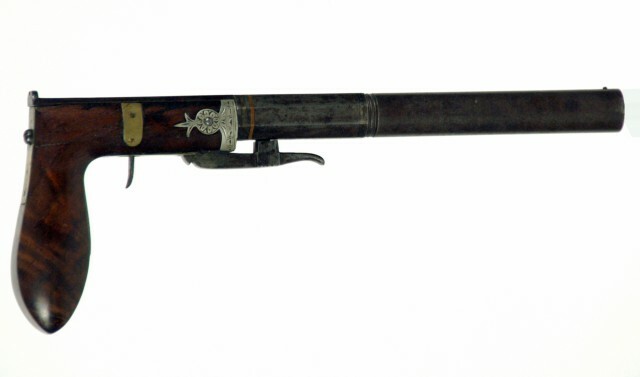 Several Henry signed guns are in the Society’s collection on display in the Pennsylvania Longrifle Museum. Underhammer Henry made firearms remain a true early American rarity.